Pictured above: A long-range AUV cruises beneath the surface in Hawaii. Many of MBARI’s research efforts are strengthened by collaborating with other teams of researchers, engineers, and institutions. In 2018, three programs will be able to conduct operations not generally within reach of MBARI vessels by working with the Schmidt Ocean Institute (SOI). SOI will provide its research vessel Falkor and it seagoing expertise, to enable operations in Hawaii, Mexico, and the open Pacific Ocean. Each of these expeditions involves MBARI researchers or engineers teaming up with others to address important science questions at hand. MBARI researchers will participate in three expeditions aboard the R/V Falkor in 2018. Photo courtesy of Schmidt Ocean Institute. In the acclaimed book “Living Sunlight: How Plants Bring the Earth to Life”, authors Molly Bang and Penny Chisholm offer a vivid story about how sunlight powers life, providing the oxygen we breathe and the food we eat. In fact, roughly every other breath you take no matter where you stand on Earth is courtesy of tiny plants that flourish in the ocean. But many of the details of that process remain to be discovered. A complex web of tiny organisms, some harvesting energy of the sun through photosynthesis and others consuming the organic matter produced by those tiny organisms, ultimately fuel the abundance of life in the ocean. Revealing the complexities of those chemical transactions in the vast expanse of the open sea is surprisingly difficult; life is not uniformly distributed, and subtle alterations in ocean conditions have profound consequences for “booms and busts” of the microbes that ocean ecosystems ultimately depend on. Historically oceanographers have taken to the sea in ships to study these processes, but points of observation from a ship are limited in space and time. A view from space tells us that the open ocean is highly structured, dynamic, and ever-moving. If we want to understand how organisms flourish and pass along the energy from the sun, moving vast quantities of elements between the atmosphere and ocean, we have to make simultaneous observations at multiple places. We also need to follow organisms as they move with ocean currents over the course of many days to reveal how their underlying genetic capacity comes into play to facilitate the magic of the chemistry that Bang and Chisholm elegantly highlighted in their book. With that in mind, and working in close collaboration with microbial ecologists at the University of Hawaii School of Ocean and Earth Science and Technology, scientists and engineers at MBARI have devised a small fleet of autonomous underwater vehicles equipped with samplers for collecting microbes and sensors for recording corresponding environmental conditions under which they were found. This fleet, dubbed MiVEGAS (Multiple Vehicle EcoGenomic Automated Samplers), is designed to collect samples of microbial communities throughout the upper 300 meters of the open sea and immediately preserve them, capturing the native state of organisms’ DNA, RNA, and protein. Each MiVEGAS vehicle can operate independently or in concert with the others. The samples they collect in concert with other autonomous devices and from ships will provide a window into the “living sunlight” in ways that have never been possible previously. 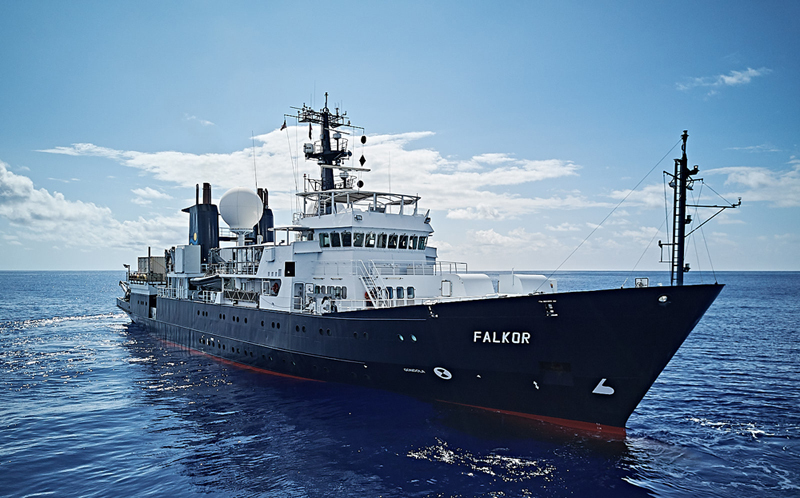 The first-ever use of the MiVEGAS fleet near Hawaii began in March 2018 aboard the research vessel Falkor, with the ship support generously provided by SOI. Development of the MiVEGAS system was made possible by grants provided by the National Science Foundation, the Gordon and Betty Moore Foundation, and the David and Lucile Packard Foundation. What attracts white sharks to a hot spot in the open ocean? The White Shark Café is an area of the North Pacific where adult sharks and other large fishes (swordfish, tuna) congregate seasonally. Each year the sharks leave the highly productive coastal waters of western North America and move far offshore to a nutrient-poor oceanic region roughly midway between Hawai’i and Baja California. While these migration patterns have been well documented by tracking with satellite tags, the reason that these important pelagic fishes consistently move to that area remains a mystery. This spring an interdisciplinary group of scientists from Stanford University’s Hopkins Marine Station, the Monterey Bay Aquarium, and MBARI will set out to solve the puzzle. Using a broad array of technologies deployed from SOI’s ship Falkor, the team will survey and define the café habitat in order to determine what makes the area so important to the life cycles of these top predators—do they come for food or reproduction, or for something else? MBARI’s role in the expedition will be to bring new technology and methods to the quest. Working with scientists at the aquarium and Hopkins, MBARI engineers have developed a camera that the sharks themselves will carry to depth to record their own behavior. The camera attaches to a shark’s dorsal fin, is triggered to turn on by conditions known to be influential in critical shark behavior at the café, and then releases itself to surface and deliver images and data to the research team aboard the Falkor. 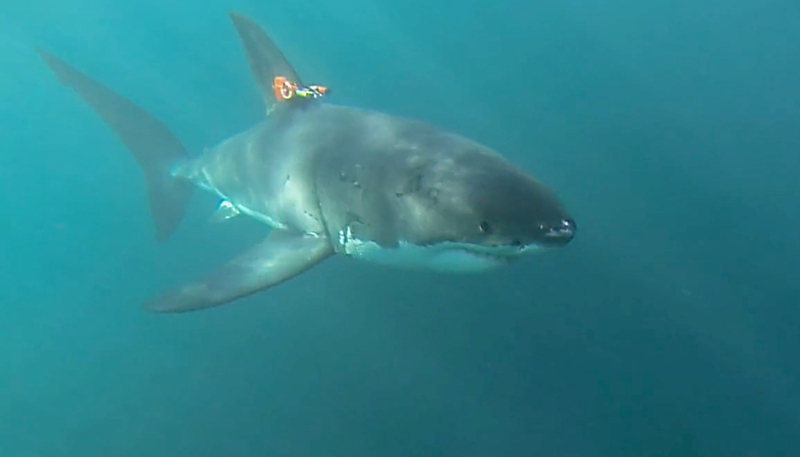 In 2015, researchers tested a prototype of their shark-cam tag on white sharks in South Africa. The second MBARI effort involves the transfer of our midwater remotely operated vehicle (ROV) methodology to SOI’s new ROV SuBastian. MBARI’s midwater research program is the gold standard for such operations and the survey and exploration techniques developed in Monterey Bay will be applied to the midwater community of the café. The ROV will be used to characterize the biological and hydrographic composition of the habitat that draws the sharks to this region, to answer the driving question: What makes the White Shark Café an oceanic hot spot for the world’s largest predatory shark? Early in MBARI’s 2015 expedition to the Gulf of California in Mexico, two mapping AUV surveys were conducted from R/V Rachel Carson in the largely unexplored Pescadero Basin with the hope that hydrothermal vents could be identified in this 4,000-meter deep sea site. 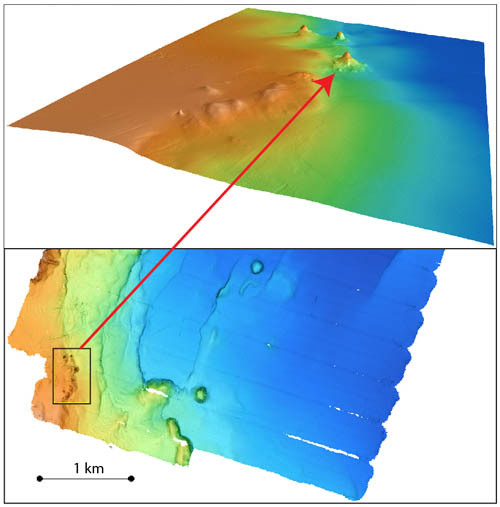 The one-meter resolution bathymetry maps revealed a group of apparent hydrothermal chimneys on the western edge of the basin, and temperature anomalies measured by the AUV suggested active venting. Five weeks later, MBARI scientists and collaborators led by Senior Scientist Dave Clague on R/V Western Flyer explored the newly discovered vent field using ROV Doc Ricketts. 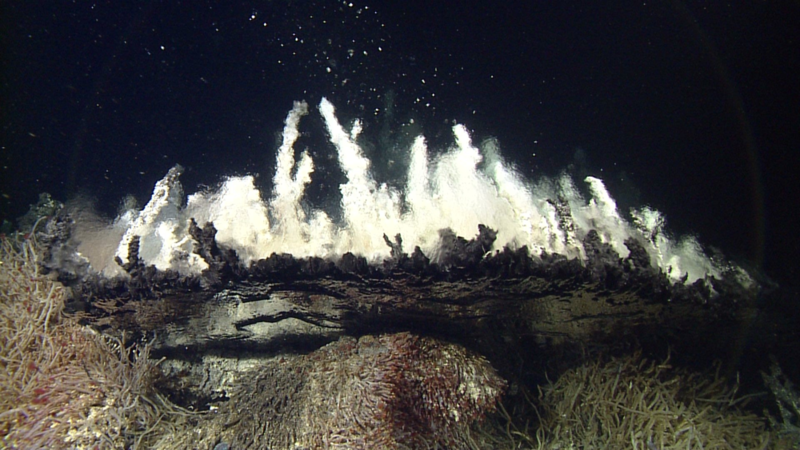 At 3,750-meters below the sea surface, these are the deepest hydrothermal vents discovered to date in the Pacific Ocean. The scientists observed carbonate chimneys emitting clear shimmering water, colonies of large tubeworms, and a range of bivalves, bacterial mats, polychaete worms, barnacles anemones, and crabs. The vent fluid chemistry, chimney mineralogy (carbonate rather than sulfide dominated) and morphology, and vent animals are all unusual. A 15-meter-tall carbonate vent structure at Pescadero Basin. Mapping AUV bathymetry showing the vent field on the west margin of Pescadero Basin. The arrow points to the carbonate chimney in the photo above. In November 2018, MBARI scientists and engineers will return to the vent field aboard SOI’s R/V Falkor for further investigations. The science team, led by collaborator Robert Zierenberg of the University of California, Davis, will conduct geological, geochemical, and biological studies of this new vent field. MBARI’s participation, led by Principal Engineer David Caress, will involve seafloor mapping at both one-meter resolution using an MBARI mapping AUV and at one-centimeter resolution using the institute’s low-altitude survey system mounted on SOI’s ROV SuBastian. The low-altitude survey system combines five-centimeter-resolution multibeam sonar bathymetry, one-centimeter-resolution lidar bathymetry, and two-millimeter-resolution color stereo photography. MBARI Adjuncts Victoria Orphan of the California Institute of Technology and Shana Goffredi of Occidental College will lead the biological investigations that follow the detailed mapping efforts. The Aquarium MBARI Incubator Initiative is an entrepreneurial venture for developing joint research projects for the Aquarium and MBARI.